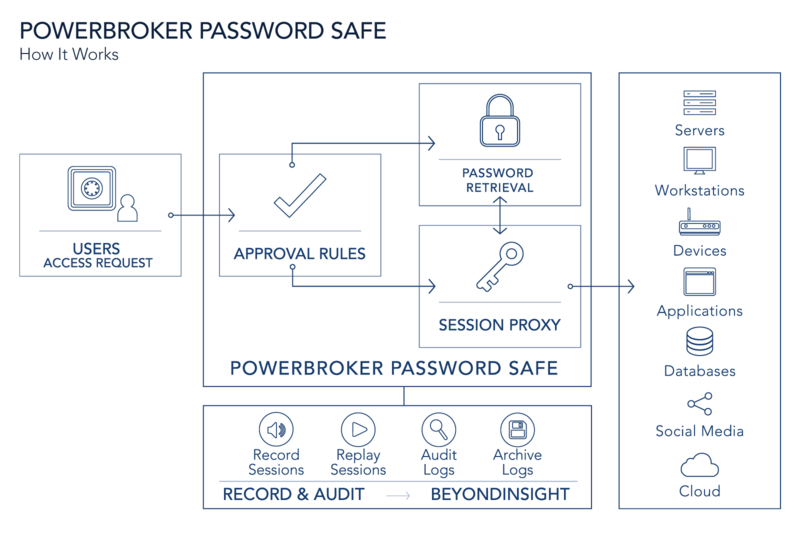 When integrated with PowerBroker Privileged Access Management platform solutions, PowerBroker Password Safe enables you to disrupt all stages of the cyber attack chain. The solutions combine best-in-class privilege, password and vulnerability management on top of a centralized reporting and analytics platform. As a result, you can efficiently reduce your organization’s attack surface, prevent lateral movement by attackers, and actively detect and respond to in-progress breaches. Find and manage all accounts: Discover and profile all known and unknown assets, shared accounts, user accounts, and service accounts. Stay organized: Quickly identify assets with common traits and automatically place them under Password Safe management via Smart Rules. Auto Discover SSH Keys: Discover all SSH keys on host systems. Keep passwords fresh: Randomize passwords on a scheduled basis or upon check-in to eliminate risk of passwords leaving the organization. Rotate SSH keys: Automatically rotate keys according to a defined schedule and enforce granular access control and workflow. Eliminate application credentials: Get control over scripts, files, code and embedded keys. Ensure password strength: Define and enforce password policy to meet any complexity requirement. Eliminate old passwords: Analyze password ages and proactively report policy violations. Identify potential backdoors: Identify uncontrolled privileged accounts. Solve the problem of remote and mobile users: Utilize PowerBroker for Windowsas an agent to update passwords on remote and mobile devices. Active/active targeted password change: Selectively process password change, password test, and account notification queue items for designated workgroups. Streamline workflow: Leverage true Role-Based Access Controls (RBAC) with Active Directory and LDAP integration for assigning roles and rights to users. Simplify requests: Manage checkout workflow with seamless connectivity to RDP & SSH via native desktop tools such as puTTY and Microsoft MSTSC. Accommodate firecall requests: Ensure access to password-managed systems after hours, on weekends, or in other emergency situations. Advanced workflow control: Provides additional context by considering the day, date, time and location when a user accesses resources to determine their ability to access those systems. Post-login command execution: Administrators can leverage a Unix or Linux Jumphost to run a specific command or script after a session connects. Multi-system checkout: Allows admins to check out an account with a multi-system parameter, then launch sessions to linked systems. Expedite checkout operations: Expedite checkout operations using OneClick for access to passwords, sessions and applications that would normally be approved automatically. Connect to sessions without an agent: With DirectConnect, administrators can launch an SSH session by simply passing a connection string to the Password Safe proxy. No agents need to be installed on the hosts, and connection to any SSH system is supported, including Unix/Linux hosts, and network devices such as routers or firewalls. Enable true dual control: Live session management gives administrators the ability to lock, terminate or cancel a session. Enforce accountability: Record privileged sessions in real time via a proxy session monitoring service for SSH and RDP – without the need for Java. Adhere to compliance mandates: Meet password protection and audit regulations listed in SOX, HIPAA, GLBA, PCI DSS, FDCC, FISMA, and other mandates. Communicate and comply: Build reports for usage, audit, forensics, and regulatory compliance purposes. Application proxy for RemoteApp: Allow any Windows application usage to be monitored and recorded. Audit and log privileged sessions: Access and watch a session, then log an acknowledgement of the review to meet audit compliance requirements. Quickly search session logs: Index and text search using keystroke to pinpoint data, and then log an acknowledgement of the review for audit purposes. Integrate with SailPoint IdentityIQ: Manage access for privileged and non-privileged accounts with privileged access management and identity and access management (IAM). RDP Enhanced Session Audit: Every click within the Windows interface, along with any keystrokes, is audited and recorded in a searchable session replay index. Real-time activity alerting: Defined user activity can generate real-time email alerts, as well as block commands, lock, and terminate SSH sessions. Command Blacklisting: Connection profiles define keyword groups that can determine a specific course of action – block command, lock session, block and lock session, or terminate session. One tool to deploy: Realize the benefit of a single solution for both password and privileged session management. Simplify deployment: Implement hardware appliances, virtual appliances, or software. Support any system: Employ out-of-the-box connectors, plus a custom connector builder for all systems that support Telnet or SSH. Ensure solution security: Rely on hardened appliances with FIPS 1402-validated components, AES256 encryption and HTTPS/TLS communications. Understand risk: Analyze privileged password, user and account behavior with BeyondInsight Threat Analytics. Increase uptime: Deploy appliance pairs and replicate settings for high availability. Active-Active infrastructure support: Allow an unlimited number of Password Safe appliances to be connected to an external SQL AlwaysOn Availability Group for unparalleled high-availability and scalability. Cache API passwords securely: Rely on password caching for APIs when administrators need access to credentials directly on a local host. Ensure API credential stability: Create aliases for APIs to map to multiple accounts so that API access is not interrupted during password changes.